Bring springs colors into your home with marbleized bud vases. Photo: Pottery Barn. Even though in Southwest Florida, we typically go from winter (such as it is) straight into summer, with a few cool and breezy days in between, it is still human nature to mark the change of seasons. And spring is a time to take a mid-year evaluation of how we want to transition into summer with subtle ways of renewing and refreshing our homes. And our spirit. So, do a little inventory of you home and decide what makes you happy this spring. And make a list of a few easy changes you do to honor the season and refresh your home. Some of my favorite rituals to acknowledge this subtle shift may help! Declutter. Spring is the perfect time as you refresh and renew your home. Eliminate anything that bothers you. A mini downsize of your "stuff" is healthy and don't be afraid to open up some space! Open the windows. Yes, some fresh air. Let all of the bad chemicals and cooking fumes out and some fresh air in. My green expert friend and designer, Peggy Oberlin of Oberlin Interiors in Naples, uses the plastic bag analogy when explaining what our homes are like. We live in air conditioning without fresh air and everything builds up inside to one big unhealthy trapped batch of air. Open the windows and let it out! Pottery Barn's pretty spring table with turquoise dishes and glass based coral stands. Bring a little "green" inside. We know that plants are healthy for our environment but I notice in most of my client's homes, there are very few plants used as decor. This does make some sense since we are surrounded by beautiful outdoor landscapes and our lanais are all filled with trees and potted plants. But pick up a few for the inside. No green thumb? Try succulents. They live despite the fact that you don't have a green thumb. Replace a few things. Like those yucky switch plates that have been around forever. Like the front door welcome mat. And definitely add or replace a few pots of annuals around your front door. They just shout out "welcome" spring. Set a pretty spring table with turquoise dishes and glass based coral stands. Photo: Pottery Barn. Paint baseboards and window sills. One of my favorite spring rituals. This gets rid of scuff marks and gives your home a little sparkly clean feeling. Now, let's add some bursts of color. Paint the front door. This is my favorite low-cost change that will make a big impact and it will also make you happy when you walk in the door. But here is the big change: paint the inside of the door as well so you can see it from your entry. Trust me. This is a great one! My favorite front door color (both sides) of the moment is Benjamin Moore's Boca Raton Blue. But try a color that you love. The choices are endless. Add spring with outdoor Astrid trellis embroidered pillows. Photo: Pottery Barn. Paint a ceiling blue. Yes. Blue. There's just something about a blue ceiling. My favorite locations: bedrooms, bathrooms and lanais. It's a very tropical, cool, calmingthing that is also brings big impact for very little money. Try it. You will thank me. Paint a piece of furniture. Add some color with an old table that you feel is brown and dull. A nightstand in the bedroom or a even fireplace mantel. Give it a new life. It will brighten up a room instantly and give it a little personality. Add wallpaper. Okay. You don't have to go crazy with this one if you are afraid. But a powder room (my favorites) or your closet are great rooms to play with. These are rooms that you are not living in all day but will love some spring pizzazz! Be brave! And while at it, add a chandelier. Spring glam! Rotate your artwork. As a Fort Myers interior, I do this for many of my clients. We all have artwork in the back of our closets because there is not enough space. Bring it all out and pick a few pieces to rotate for a season or two. It's like shopping in your own closet because you have probably forgotten about it! To celebrate spring, there are a few purchases that will go a long way to welcoming a new season. Pillows. If you don't add anything else, change the pillows on your sofa for a totally new look for spring. I like doing this frequently and it is perfect for a seasonal transition. Set a pretty table. Think about an inexpensive, colorful set of dishes. Napkins, table cloth and centerpiece. There is not any better (and fun) way to bring spring into your home than a new table setting. You know you are bored with the same old tired looking stuff. Time to refresh it! Create a spa in your bathroom. This would be a great time to give your bathroom a mini makeover. Transition it into spring with a spa look. White walls, blue ceiling, white fluffy towels, white rugs. Frame the mirror. Voila! A new bathroom. Add fresh flowers to every room. This is my favorite. Because it will not only add color to a room but it just makes you feel food. 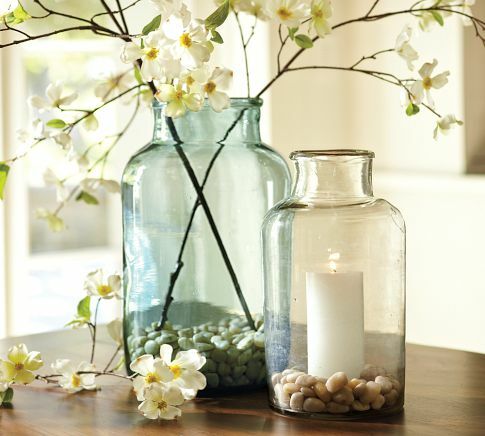 Invest in a few new vases and be creative about what you purchase. My favorites: turquoise and green bottles. I like to buy large bouquets and break them into bunches of solid colors and arrange them throughout the house. And don't wait until house guests arrive. Do it for yourself. Whatever changes you make to welcome spring, enjoy your home in this new season. There are only 32 weeks until Christmas! Spring flowers, trees and a bench in the entry set the tone for the exterior. We always talk in this column about decorating our home's interior and how to make our outdoor spaces beautiful (coming soon), but with spring around the corner, I think we should pay a little attention to the sometimes overlooked curb appeal of our homes. One of my favorite British sitcoms features in every episode, a home that has a broken mail box, a garden gate that falls of the hinges, car with a flat in the driveway, cracked sidewalk leading to the house, light fixtures hanging from wires, chipped stairs leading to the door. And when the homeowner greets guests, you see that the interior perfectly matches the exterior: a disaster. I laugh at this show every week. And no, in all of my years as a southwest Florida interior decorator, I have never encountered anything quite this dramatic while making my way to a client's front door. Although I did once break the heal on my shoe because of pavers that were too far apart and I did have a client's dog eat my shoes while I was on a ladder hanging artwork. Decorative items, shutters, lighting and flower pots say "welcome home." • Upgrade your mail box from the one that you have had since you moved into the house. If this is not possible because of homeowner rules, at least clean it out (cobwebs) and plant some colorful flowers around it. • Repair pavers or cracks in the driveway or sidewalk. • Freshen up the house numbers. Invest a few dollars little in a customized decorative plaque with your numbers. • It's a great time to clean/replace outdoor light fixtures and make sure you have enough light. A dark entry is not inviting nor is it safe. • Paint the front door, trim on the house and shutters if you have them. If you read this column regularly, I always suggest painting the door and the trim around it every spring. Give some thought to the style of the home and don't be afraid to go bold! Mine is currently turquoise! • Evaluate thepaint. If you are selling your home, a fresh coat of paint is the bestway to update your curb appeal. • Update your door bell or knocker. • Plant spring annuals in your front yard. Around trees and to line your sidewalk or driveway. • Style the front entry. I do this for all of my clients. A seasonal wreath on the front door. Container gardens from a nursery, Lowes or Home Depot are my favorites. They are fast and inexpensive. Place them in pairs on either side of your door to add a welcoming touch. • Add some accessories! A piece or two of artwork that is weather-resistant such as a birdbath in the yard surrounded by plants and flowers or a metal sculpture at the entry, set the tone for entering your home. • Replace your door mat. Realizing that it is only January 15, I woke up this morning to 35 degrees in southwest Florida and started to think about spring. It must have been a flashback to my Virginia Peninsula roots. This is the time of year that I always started to dream about summer days and wish they were not so far off. Photos courtesy of Garnet Hill.Today is a glorious, sunny, blue sky day in Florida. But it is cold. We have about three days a year that are like this. So, while I was rummaging through the back of my closet for my Ugg boots, I was thinking cold. But when I saw this gorgeous photo from the Garnet Hill catalogue, aside from wanting this room with its great light, beautiful distressed, whitewashed flooring and the jewel-toned hooked rug, I started to think about spring.